Koei has announced a February release date for Dynasty Warriors: Strikeforce for the Xbox 360 and PlayStation 3, the first game in the series to feature online multiplayer, as well as Ninja Gaiden guest stars. An upgraded version of the PSP game for console players, Dynasty Warriors: Strikeforce brings the battle for ancient China online, allowing up to four players to participate in raids, take on giant enemies, or simply battle it out competitively. Strikeforce also features new Fury transformations, drastically changing the look of your character, granting them new powers, enhanced speed, and the ability to fly. It almost sounds like they've taken a page from Dynasty Warriors: Gundam. The console version features more than 40 exclusive missions, an enemy Hyperbreak gauge, command of up to three AI-controlled officers in single player mode, a new character, and the ability to trade officers online with other players. Now how much would you pay? But wait, there's more! Both versions of the game will feature exclusive guest characters, with the PlayStation 3 version scoring folks from Tecmo's Ninja Gaiden Sigma 2, and characters from Warriors Orochi 2 for the 360 version. Completing challenges with these guest characters allows players to use their signature weapons in combat. All of this, plus planned DLC to keep the game fresh for a long time coming. It sounds like a Dynasty Warriors fan's dream come true. 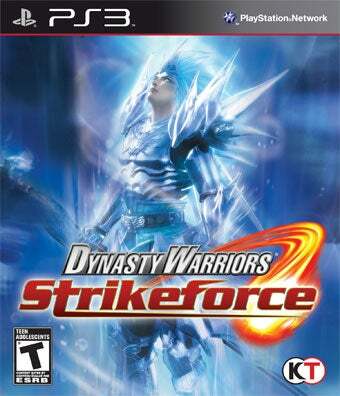 Dynasty Warriors: Strikeforce hits store shelves on February 16th.